In the days before I was gluten-free, whenever the choice arose between Oreos and Reese's Peanut Butter Cups I would always go for the Oreos (which is a choice I happy don't have to make anymore). A few days ago one of my coworkers got lunch at a fast food restaurant that serves Oreo milkshakes, and needless to say I got the next idea for what I wanted to make gluten-free. So after searching the internet, I came across this recipe and decided to try and make it gluten free. Also, I got a coffee maker for Christmas, so I wanted to test making a coffee filling for some of the Oreos. After tasting both, I highly recommend the Mocha Oreos vs the Classic, has a much more robust flavor. 0. Preheat oven to 350F. 1. Mix the flours, gum, cocoa, powder, soda, salt, starches, and sugar in a medium bowl until blended. 2. Cut the butter into small pieces and then blend into the flour. 3. After the butter begins to blend into the flour, add one egg. Mix until dough starts to form. 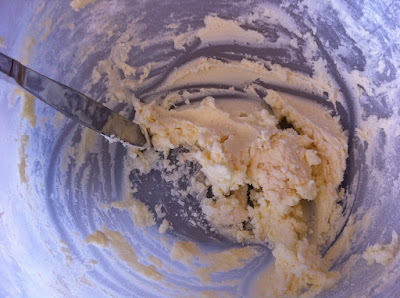 If the dough is very crumbly and does not come together into a dough, add the second egg and blend until a ball forms. 4. Onto baking sheets lined with parchment paper, spoon tablespoons of dough onto the cookie sheets. Wet your fingers with water, and smooth out the dough balls into the shape of Oreo cookies. 5. Place in the oven, and bake for 10 minutes. Cool cookies on a rack until cookies are room temperature. 1. In a bowl, beat butter, vanilla and shortening until fluffy. 2. Slowly beat sugar into the butter mix. Continue mixing until light and fluffy. 3. If you are making half the batch coffee flavored, split the filling into half. 4. Whisk the coffee into either half or all of the filling, depending upon your preference. 5. Spoon the filling in between each pair of cookies and gently press into a sandwich.